VIADUCT TOWN HALL 6pm, Tuesday, Jan. 16 at the JES — Why Save the Viaduct? To Keep Kids Safe. During his noon, ErieNewsNow live TV interview on Jan. 12th, Rev. 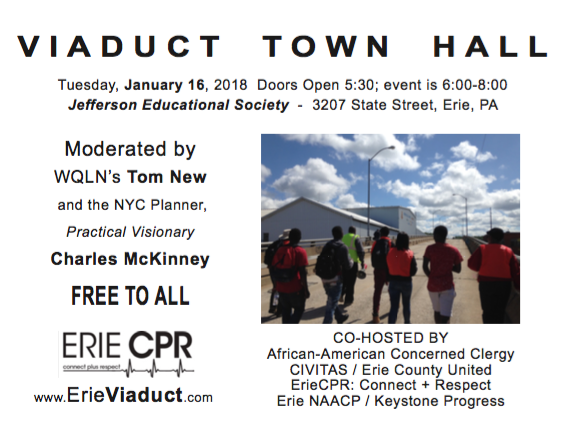 Charles Mock, of the African-American Concerned Clergy, asked all concerned citizens to cancel whatever plans they have for next Tuesday night and to come to the VIADUCT TOWN HALL on January 16 at 6pm at the Jefferson Educational Society (3207 State) to learn the facts about the condition of the Viaduct, the cost to stabilize the Viaduct, the funding to cover the repair and maintenance, and the safety issues surrounding the plan to force children to walk to school along an arterial highway. In addition to Rev. Mock, architect Adam Trott will present, and, several other community leaders will participate in a panel discussion which will include questions from the audience. Older PostPress Release: Two Professionals to lead January 16 Viaduct Town Hall at J.E.S.